I have a confession. I read this book for the first time when I was in my teens, like so many others of my generation no doubt. So this review, though my first for ‘Salem’s Lot, is in fairness based on my recent half term re-read. But no matter, the book gets better and more terrifying and inspirationally landmark as a reader and writer with every heart stopping visitation. Prior to reading the book, I watched the classic US television series that serialised the novel, starring David Soul, and James Mason and produced by Richard Kobritz. For many years both sort of co-existed in my mind, one propping up the other in a horror double whammy that remains my benchmark for creepy, believable storytelling. One reason why the television series was so very scary is that it managed to recreate the same tone and tenor which King conveys to the reader through the pages of his long novel. Both create a believable, photographic portrait of modern small town American reality of its day, while at the same time dissolving slowly the boundaries of what we accept as possible until the sinister occultism of the book stands behind you, fang mouthed and watching. The book is masterful in part because King does not hurry the reader. He increases the sense of suspense and menace in slow, unpleasant pulses; and they catch us, like the deepening shadows of a dusk that, once so safely distant, is suddenly upon us, and heralding the creatures of the night. King is a fan of Arthur Machan’s The Great God Pan, and his homage is there throughout ‘Salem’s Lot. Never more so in his portrayal of infectious panic that slowly spreads through the rational protagonists and so to us, the reader, when we are left with nothing to do but believe that all is not what it seems and never will be again. I’ve never had the honour of meeting Stephen King, but I did meet David Soul in a pub in London’s West End about fourteen years ago. My mate Paddy was working the show he was performing in and we all stood and had a pint. The conversation moved to ‘Salem’s Lot. Soul was aghast to learn that I’d watched the whole thing aged six! My Dad, who now freely admits that he was too scared to watch it alone, lodged me into the crevice of the sofa next to him and made me his wing man. I remember he was eating cheese and having a beer. When I asked him could I have some cheese, he cautioned against it as he’d heard it could give a child nightmares before bed! Ah now, only in Belfast. I think he probably let me have a sip of his beer. Or two. I first read ‘Salem’s Lot as a teenage fan, but I now revisit it as a writer. Oh, but a man has to be careful. King wrote this thing on his wife’s typewriter in the back room of a rented caravan he and his young family were living in at that time. He was working full shift as a High School teacher, not unlike the day job I now do, but he was, unlike yours truly, a young fella with no grey in his beard. And ‘Salem’s Lot is what he produced. To approach such facts from the wrong angle could be incline a forty something writer to down tools and walk off the job at hand. After all, King’s vampire epic is better than what many of us can ever hope to create. But, be that as it may, I’m not that man. I see the hope in the horror and I return to this book as much for lessons on how to weave the poetic and page turning, on how to be brave with the pace and be true to the tale one hopes to tell, however outlandish and improbable. I also go to King because he’s a guy who managed to do the lot (sorry, that one just slipped out). He worked a day job, more than one, he had a young wife and the ups and downs of a real marriage, and he had a young family and wrote books. Not the books others wanted him to write, not the books that would follow a market trend. The books that lit a spark in his dark mind and kept him returning to that little room where the magic happened. I was interviewed for an Irish TV channel last week about my novel Blood Will Be Born and was asked whether someday I’d like to write full time. I felt like I fumbled the answer, but what I wanted to say was yes, of course, but, also to quote King who once said that art is here to support life and not the other way round. 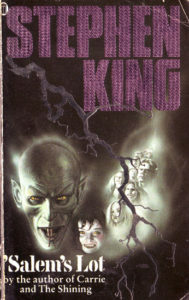 ‘Salem’s Lot, perhaps more than any other King novel has been a support for me. From guidance on the craft, to assurance that one’s story is worth telling, to a reminder that a good story, perhaps even a great novel, is possible while life insistently, and very rightly, gets in the way. But mostly, it’s been a support in the very best way that a terrific story, beautifully constructed and characterised and masterfully unfolded always is. It’s the window into another world, this one best entered with the lights out and a cross and holy water at hand, whether you believe in any of those things or not. When reading ‘Salem’s Lot, first time, or tenth time, it’s best to go prepared, because all is not as it may seem. Book Review: In The Name Of The Son. O’Rawe was Conlon’s childhood friend, and paradoxically it is because of this intimacy that he manages a largely dispassionate and empirically balanced account of Gerry Conlon’s experiences. While growing up together and when reunited later in life they were able to tell each other to ‘wise up’ as and when required (get real, be honest in Belfast terms). O’Rawe brings this rectitude to his writing too. He tells the truth about the callous and ultimately indiscriminate bomb attacks undertaken by the IRA in 1974 for which the Guilford Four and the Maguire Seven were wrongly convicted. As far as the IRA was concerned, ‘…if civilians got blown to smithereens, then so be it; it was their own fault.’ He acknowledges that Gerry Conlon was a petty criminal who cracked under extreme duress, signed a false confession admitting to carrying out IRA bomb attacks and also implicated innocent members of his own family. But he also gently reminds us that while some to this day still view him as perpetrator rather a victim because of this human weakness, Gerry Conlon was in fact the first casualty of his own signature. The blame for both mass murder and then the massacre of justice should be laid at the doors others, but not with Gerry Conlon. The psychology of human induced disaster is a complex field. When isolated errors happen the consequences are usually contained. But when man made catastrophe strikes more often than not numerous mistakes and malpractices have aligned like a key in a lock. In an attempt to understand, some use terms like Conformity, Group Think, or Attribution Bias. Others speak of conspiracy. For O’Rawe the initial miscarriage of justice against Conlon and the perpetration of this across long years was the result of an institutionally corrupt barrel rather than a single rotten apple. The prevalence of ‘noble cause corruption’ permeating the police, forensics and judiciary in Britain in the 1970s and 1980s, the apparent suppression of an alibi witness for Gerry Conlon by the Crown, and the dismissal of an IRA confession to the crimes for which Conlon was serving time paint a bleak picture. The darkness followed Gerry Conlon long after his release. Tortured by nightmares and flashbacks, unable to create meaningful romantic relationships and blowing his compensation money on drugs and wild living, he was a man on the run from himself. And despite his encyclopaedic memory, Conlon struggled to recall the face of his father Giuseppe, so deeply did the guilt of his death in prison in 1980 remain locked up inside him. Despite this gloom, it is the light and the hope that makes O’Rawe’s biography so important. We follow Colon’s unapologetic lust for life after his release when he lived in north London. He details how Gerry Conlon moved from one all-consuming reason for being to the next, and the passion, determination, interpersonal finesse and courage he brought to all he did. 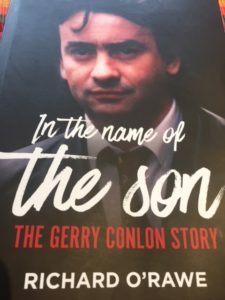 Conlon certainly made the most of his freedom; from the publication of his book Proved Innocent in 1990, to the realisation of In The Name Of The Father three years later, Conlon made things happen. His determination to do everything he could to free the Birmingham Six became a leitmotif in the last years of his life when he carried out unceasing work on behalf of miscarriage of justice victims internationally with MOJO. From the Aboriginal people of Australia to Native Americans in the USA Gerry’s work eclipsed the wasted years in prison and the time he’d wasted as a free man imprisoned to hard drugs. And yet, it is the story of personal rehabilitation which Gerry Conlon finally managed which is the greatest message of hope. O’Rawe details the healing work of Gerry’s psychotherapist Barry Walle in every bit as much detail as he does the litany of failures and corruption that sent Conlon down. In 2005, the Guilford Four and Maguire Seven received an apology from Prime Minister Tony Blair. Gerry’s relative Patrick Maguire was just thirteen years old when he had been wrongfully convicted of having nitro-glycerine, and for many years was full of hatred for Gerry Conlon whom he blamed. That day he shook Gerry’s hand and spoke words of reconciliation. It took a long time, but in the end Gerry Conlon was, as he said on his death bed, ready to meet his father because he had finally forgiven himself. In contrast to his tortured sleep while alive, I hope he now rests in peace. I wonder if those people who played a part in his wrongful conviction and imprisonment can sleep as easy in their beds at night. Final Installment: Whether you focus on the journey or the destination, completion is the key to successfully writing your first novel. Writing a novel is a bit like embarking on a regime to avoid chocolate or mid-week wine in the run up to Christmas. Both are easy enough to start, harder to remain on board with and a true challenge to see through to the end. According to Stephen King novels are completed one word at a time, and let the story be boss. Plot at your peril and fear not; as you dig, it will be revealed. I don’t dare suggest he’s wrong (check out his list of published works) but his way may not be right for you. Certainly, King’s approach helped me cover a lot of ground, but by the time I went to Crimefest 2016, I’d lost my way. CJ Carver, speaking on a panel that year, said that a book will find a natural “tipping point”, an apex from which the rest of the write is a downhill journey. I liked the sound of that very much. Once home, I went in search of the fulcrum in my novel. What I needed was a nice clear overview. What I ended up with, was the wall of my writing room at home plastered with sheets of paper and post it notes, annotated in felt tip pen detailing main events and character story arcs and lots of question marks circled several times. My wife, who had already started making allusions to Jack Nicholson in The Shining when talking about my writing, gave me one of her looks. She said the wall looked like Nash’s garage in A Beautiful Mind, just before his imaginary friend demanded he kill his spouse. Some of the road mapping proved useful, much of it did not. But one good thing to come from it was the final scene, a place where all the strands came to an end. When I closed my eyes, I could see it, albeit hazy, and lacking specifics, but the situation was suddenly clear. The story-boarding helped me see it, and in turn having an end point presented the clear challenge I needed to thread the various strands of the story to a natural end, and one that felt right. Not exactly what CJ Carver said, though looking for that tipping point was helpful. And not quite the same as Stephen King’s methodology (I’d still be writing the book now, and it would be as large as some of his own if I had kept going that way). I think what worked for me contains some elements, some points of similarity with both. There’s a lot of noise out there about story strategies, formulaic plans for fast track completion a novel in record time. If they work for you I wish you luck, but I cannot believe that something as personal and self-generated as a novel can ever be flat packed. Yes, the points of similarity of what make a good or successful completed novel can probably be reduced to discernible patterns, even pathways. But our stories, like our prints, are unique and to tell them, I think we need to find our own way, from beginning to end. Going back to that regime to abstain from wine or chocolate, it’s ok to fall off the wagon, to have a mouthful of red or brick of chocolate. But you have to stick at it. The same is true for writing. No matter if you excavate, seek out a tipping point, or use a story stencil to write by numbers, you must turn up for work. Fundamentally, that’s the missing link between novels that are completed and those which are not, assuming you are telling a story that is both honest and right for you at that time. As someone more eloquent than me put it, “Write when you want and write when you don’t.” If we don’t, then catching glimpse of your story’s final scene and even finding a path to take you there are as useful for completing a novel as red wine and chocolate are for losing weight. 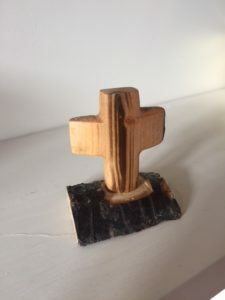 This little cross is on my fire place at home in London. Not because of Christianity, though I have to admit I’m fond of the odd icon, takes me back to being a kid. As a matter of fact I have artefacts from Judaism, Islam and Christianity in my home, because in our wider family circle, all these cultures and beliefs co-exist. Makes my house a bit Life of Pi, but it’s all the better for it. I also have some hand painted pine cones my daughter decorated. I picked them up walking on Zakynthos last summer. And they have nothing to do with religion. Beautiful things all, that’s why I keep them. The little wooden cross was a gift from my cousin Jim Deeds. He was over from Belfast for my book launch in September, and the craic was 91 as we like to say. Next morning, tender heads and small steps, he asked me if he could take a piece of wood from my back garden. I’d pruned back a plum tree the year before and the branches were stacked and waiting for a wood burner that never materialised. I told him to take his pick. He sawed what he needed, packed his bag and off he went. When he returned last week for his birthday, a visit which saw him crowned King of the West End incidentally; he gave me the little cross. Over a few beers he explained the work that he’d put into creating it. It was hand carved, absolutely no machine tools used, sanded again and again and oiled until the grain had absorbed the lacquer and it felt smooth as stone and warm to the touch. And not his main gig either. See amongst many other things our Jim is a writer too; a published poet, and his latest book, Finding God in the Mess, Meditations for Mindful Living is available now. OK, I have to be straight with you here. My cousin and I could not be on more distant ends of a spectrum when it comes to genre, interests and potential audiences. My book BLOOD WILL BE BORN is a crime thriller, and nobody in it goes looking for God in the mess, spends their time carving crosses or espouses Christian mindfulness. But each to their own, as I just said I’m cool with people having their religious and cultural expression. But the point I’m trying to make here is not about religion, it’s about writing. For me, the art of writing is not about finding God in the mess. But it is about finding beauty in the chaos. No matter the genre, or the audience, good fiction writing must be both brutally honest, and have a have a beauty that takes us beyond this world. Yeah, we have to cut and carve, but especially when writing a novel, you have to sand, and smooth and oil the work again and again until it shines, and tells us something about this world and our experiences that can maybe outlast the person who wrote it. BLOOD WILL BE BORN may not do all these things, but I had the best of fun making an attempt. Amid the violence and psychosis that exist in the novel, I also found some unexpected symmetry, and a satisfaction in creating something that attained enough balance to stand alone, a little creation. In this way Jim Deeds and I are two sides of the same coin. The cross is one of the most horrendous creations of all time, an instrument of torture which was used to prolong agony and humiliation. I have sometimes wondered who invented it. Imagine that was your day’s work. In short it is, without a great deal of argument, one of the worst things ever to have entered this world. And still, artists have turned to it, those who are religious and those who are not, and created lasting, stunning images which, as is the case with all good art, make the world a better place. Stunning art is not always easy to swallow. Portrayals of the crucifixion, like scenes in noir crime thrillers, are not necessarily sanitised and smooth, nor can they be. I did say we have to saw, and carve. Jonathan Jones writing in the Guardian earlier this year said that Lucas Cranach the Elder’s 1503 painting of the crucifixion haunts and disturbs him. Have a look online, you’ll see why. Take Mel Gibson’s Passion of the Christ, a modern equivalent. It has had its fair share of criticism for being gratuitously violent. I’m not here to hold a brief for Mel, but in my mind, such depictions of real world violence, however graphic, are still art, and in their own way, give us a terrible beauty that is larger than the brutality which they depict. I remember how the violence in Stuart Neville’s debut The Twelve and Adrian McKinty’s Dead I May Well Be stayed with me after my first reading. But not in the same way the details of real life torture in Martin Dillon’s The Shankill Butchers infested my mind and haunted me, as they did him. That’s why I have Jim’s little cross on my fire place, a beautiful work of art modelled on human suffering and turmoil. It’s a good reminder of what I aspire to achieve when I sit down to write. A brief history of how I wrote BLOOD WILL BE BORN. The first 10K words of Blood Will Be Born, and I’d wager any first novel, were fuelled by a sweet cocktail of incredulity and joy. Nothing’s perfect mind you. Like many new born babies, first drafts can be ugly looking critters. I’d got as far as Fryer waiting to be busted out of the Heights, Christopher visiting his Granny (he did not take her chocolates, even back then) and an overlong series of back and forth scenes that introduced us to Owen Sheen arriving in Belfast and Aoife McCusker waking up late. There was a flabby dream sequence in which Aoife had a premonition of Fryer’s shenanigans and the Prologue set in 1976 was nowhere in sight. I was not absolutely sure what Sheen was up to and Christopher was a cardboard cut-out whom I did not fully trust to come to life. But I was packed and excited ready for the journey. Passengers are advised to check the departure board for updates. I waited and watched, but no destination appeared on that board. Not even a gate number. I squeezed my conscious mind (probably the single worst starting point for novel writing) for ‘the story’, but found nothing. In hindsight, this was perfectly understandable, because the story had not been written yet. You can see the nature of the problem. My way round the wall appeared when I stopped racking my brain for answers. I really did not know how the story would evolve, because, of course, it was not my story. It was Christopher Moore’s, Fryer’s, Sheen’s and Aoife McCusker’s world, and their story. So I asked them. And that’s when things got back on course once more. I knew what Christopher wanted to achieve, and when I started to think as he would think, however warped and unpleasant that was, I found an answer to the question of what happened next. I was about half way through the novel when dissident Irish republicans detonated a bomb at an electricity substation on the outskirts of west Belfast (I thought I’d invented this Belfast ‘Plug’ but apparently not). Unlike in Blood Will Be Born, no-one was killed thankfully, and they failed in their attempt to black out the city and cause chaos. Life imitating art, imitating life; that event gave me a shiver. But I’d be lying if I did not admit that I felt some excitement too. You see, it was evident that I’d got it right, that the novel would have the gritty authenticity that might just draw a reader in and leave them wondering, how much of this is true, or could be. It’s a well-used maxim that you should write what you know, but when it comes to deep mine excavation on Mars or how one might demolish a fragile Irish Peace Process, that’s not always possible. But if your back’s against a cold brick wall and you can’t find a way through, my best advice is to ask your characters the right questions and follow their words. It’s their story after all. For me, stories begin with images more often than not. Sometimes they’re grainy, but more often visceral and clear. Blood Will Be Born started in this way and was written on and off between 2014 and 2016. But the vision that fathered the novel can be found further back. In 2006 I started to write a short story that I did not finish. It featured an old Irish man, sitting out the dead hours of the night alone. Or, perhaps, he is not entirely alone. The story remains unwritten, and over time, my vision of the old man faded, as did his story, until both had disappeared entirely. Or, perhaps, the dark matter that makes up such dreams never really disappears. Like all energy, the potential for a good story does not really get destroyed any more than it is actually created by us in the first place. It simply changes form. In 2014 I enrolled in an Online Novel Writing Course under Scott Bradfield at the City Lit. We ‘met’ (a team of four of five regulars spread between the Hebrides and London) virtually, once a week to critique each other’s homework assignments, discuss lessons from reading exercises and benefit from guest writers. When it was my turn to write a thousand words for shared weekly butchery, something weird happened. I saw a man, sitting in a sparsely furnished apartment, candle light flickering. In one hand he had a near empty bottle of fortified wine, in the other, he held a razor blade. His arms were bare and they were scarred. I knew he was a former paramilitary prisoner of the Irish Troubles; a man of violence who remained a captive of his past. When the wine was finished, the blood would flow. Not the same old boy from my 2006 story, but I’m pretty sure both visions shared the same DNA. The little homework piece was returned to time and again until the man had a name, John Fryer, and I knew what he was really afraid of; the Moley. Each artist is different. John Lennon once said that song writing for him was like being a spiritual medium; the words flowed onto the page through but not from him. I can dig that. Want to start your first novel? Put a sign on the door that says ‘GONE FISHING’, and close the blinds, cast a net into the black waters. See what you haul up, look it in the eye and start to tell its story. But mind how you go, you might catch a monster.